Once you have learnt the basics of how to change gears and when to change gear, the more advanced technique of block gear changing enables easier gear changing and is often required for the driving test. Years ago due to the mechanical limitations of certain cars, block gear changing was either performed infrequently or not at all if the vehicle in question struggled. These days with modern electrical and mechanical developments, cars are capable of withstanding a wide range of driving techniques. Whilst some are regarded as bad techniques and others good, block gear changing is a modern driving technique that has many benefits. Whilst learning to drive, you should learn and be taught block gear changing by your instructor. Whilst some instructors may teach this to a greater extent than others, the most frequent use of block changing should be employed in driving lessons and the driving test. The speed at which your car is travelling is relative to the gear your vehicle is currently in. Essentially there is little point changing into a gear that is not relative to the speed of your car, so you would basically miss out that gear altogether. or miss out multiple gears depending on your current or intended speed. As you increase speed, you will go up through the gears and as you decrease speed you will go down through the gears. Block gear changing can be made up and down through the gears. Block gear changing up is not often used simply because it’s often easier on the engine to go through the gears in ascending numerical order. An example however could be that you’re traveling down a dual carriageway or motorway slip road and accelerating hard in 3rd gear. Reaching a speed of around 40 to 45 mph, you notice that the first lane on the carriageway is perfectly clear. At this speed there is little point in changing into 4th and makes better sense changing directly into 5th gear. Generally speaking, if your speed accelerates past the speed in which you would normally change gear, use the next one up instead. Block gear changing down is frequently used, it should be taught during driving lessons and is expected during the driving test. A frequently used example of block gear changing down is whilst driving around towns and cities. You’re driving in 4th gear at 30 mph and intend on taking the next left turn. Instead of using the gears to slow down as you would have many years ago, modern driving techniques suggest that you should use a combination of engine braking (letting the car naturally slow down) and physically pressing the foot brake to reach a suitable speed of around 10 to 15 mph to make the left turn. 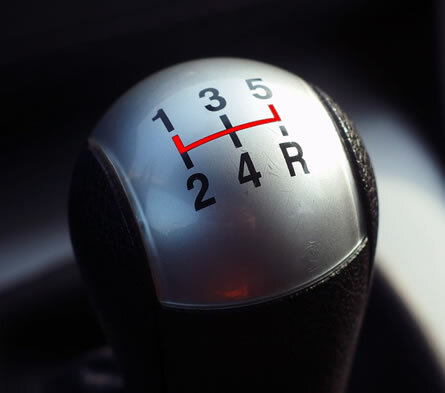 You will have no need for 3rd gear and can simply shift from 4th gear directly into 2nd gear. The benefits of block gear changing, especially changing up, is better fuel economy. Missing a gear when changing up if necessary will allow the engine to work easier and will use less fuel. Frequent use of block gear changing down will reduce wear on the clutch and gearbox, both being rather expensive to repair or replace. Block gear changing also allows for greater time for both hands to remain on the steering wheel and greater concentration on the road ahead. Is block gear changing required on a driving test? To a certain degree it is although it’s not a rigid rule that must be implemented at any given chance. An example of when you would be expected to block gear change could be that you are traveling along an outer city or town road at 40 mph in 5th gear. A little up ahead traffic lights turn red and you will have a certain stop. You will be expected to keep the gear in 5th and to use a combination of engine brake and foot brake to slow the car down to around 5 to 10 mph and change directly into 1st gear from 5th in a modern car. Using all the gears in descending order to slow the vehicle is a great deal of work for the vehicle, for you, will detract from your concentration of the road ahead and is basically unnecessary. Failure to incorporate block gear changing during a driving test won’t necessarily fail you although it depends on the frequency and necessity. So essentially if the examiner feels that a lack of correct use of block gear changing or an absence of it affected the ability for you to drive safely, then it could likely result in 3 or more minors being accrued for ‘control – use of gears’ on the driving test report sheet and result in a test failure. See driving test report explained for further information. Town and city roads 30 to 40 mph can be driven in 4th or 5th gear and left or right turns are often taken in 2nd gear. From which ever current gear, slowdown in plenty of time to around 10 mph and change directly into 2nd gear. Very narrow or closed junctions may require a direct change into 1st gear where the car speed will need to be reduced to 2 to 5 mph. This depends on the type of junction whether it is open or closed (if you can see enough to continue or need to stop). See junctions for further information. Approaching a closed junction in 3rd or 4th gear will require that you block gear change directly from your current gear into 1st at 5 mph and under. Regardless of the current gear, most modern cars allow you to continuously slow the vehicle naturally and using the foot brake from whatever speed originally to then be slow enough to engage 1st gear. There are other forms of block gear changing although those are the most commonly used and is recommended to use during a driving test. As you progress in your driving skills you may at some point wish to overtake another vehicle. A common block gear change although unlikely to be used in driving lessons or the driving test is to change down from 5th gear into 3rd. If driving at around 40 mph, this will provide a significant amount of power to the engine and allow you to accelerate quicker past a vehicle. It also significantly decreases fuel consumption however. Block gear changing requires that you have a good understanding of how to change gear and when to change gear. To become proficient you will also need to become adept at anticipation and planning; involving judging the road ahead and dealing with it in advance. Below are further gear related tutorials that may be of benefit for learning to drive. Yes, when ever changing any gear, you must first depress the clutch pedal. Block gear changing is a little more advanced after a learner has gone through basic clutch control and gear changing.